Against my better judgment, I recently googled "chainsaw kickback accidents" and looked at some images which made my stomach churn. You see, a chainsaw kickback is when the chain raises up back towards the use at a rate so fast that can have cut deeply into your face before you even realize your nose is split in two. So, even though I use good practices to help prevent a kick back, as a keen woodcutter around the neighborhood, I thought it was time to properly invest in some safety equipment to protect my face from a lethal chain. So I entered the chainsaw safety helmet market as a buyer with intent! Frankly, anyone who uses a chainsaw should be wearing safety gear like gloves and trouser chaps but at a minimum, a helmet with a face guard is simply common sense. It doesn't matter if you a weekend warrior or a seasoned professional. 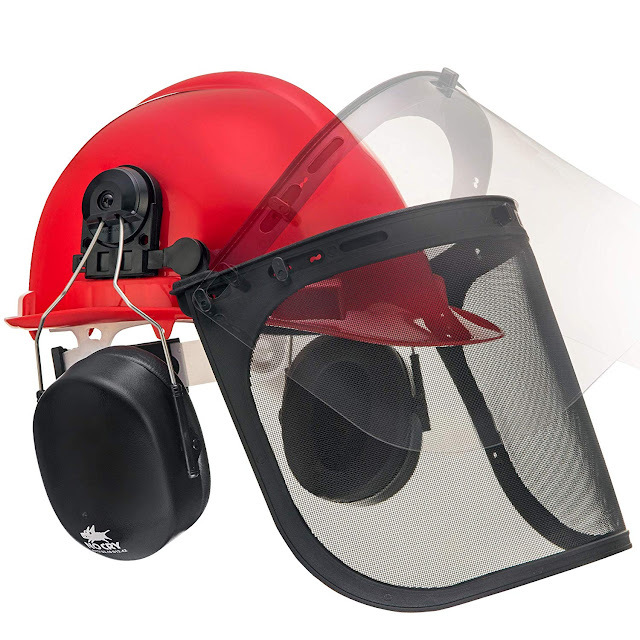 I was pretty keen to get a helmet with a mesh visor because my neighbor actually has one which he uses when using his weed whacker. While he's not going to get a chainsaw to the face with the weed cutter, he's preventing any debris that gets thrown up from hitting his face. Also, it may be obvious to state but given most people wear earmuffs when using a chainsaw, it would be quite handy to have a helmet that features muffs that really cut down on the noise. So what did do? I simply went to Amazon and searched for a helmet that had the features I wanted - mesh visor with ear muffs. It took its sweet time getting here over the Christmas period and then I realized I had to assemble it myself. It was pretty easy to do actually and soon enough I had it ready to rock and roll. I installed the mesh visor and left the polycarbonate face shield for another day as I heard they can fog up pretty easily if you get all sweaty when chopping wood up. I found the hat was pretty light on the head, so it felt good. The unit has a headband that you can adjust with a simple turn of the knob at the base. So it fits really well. The ear muffs worked really well. I walked around the house and I couldn't hear the kids screaming at each other over whose turn it was to pick a show on Netflix so win. It was fine with the lawns too! The helmet was advertised as meeting the Z89.1-2003 ANSI rating which assures me that the helmet has been actually designed to help protect against chainsaw accidents. This does not mean that it's foolproof however, just that it will help protect me. So that means I should always continue to follow safe chainsaw use practices. Check out the helmet options on Amazon.